Thank you for considering Joe’s Limousine Service for your transportation needs. 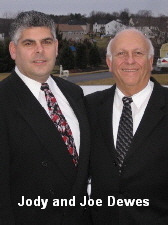 We are a father and son owned and operated business. We have been in business since 1967 in the Atlantic City, NJ area and we are extremely proud of our safety record. Your business is of great importance to us. We look forward to being of service to you. We serve all New Jersey, Pennsylvania and New York major and private airports. Our professional drivers will arrive in a spotless limousine or town car to provide you with the best transportation experience. From the moment you make your reservation with Joe’s Limousine Service you will experience the best in customer service. Joe’s Limousine is the perfect choice for your business or personal transportation needs. This Web site may contain links to web sites maintained by third parties. Joe’s Limousine Service has no responsibility for the content, pricing and or offers contained within them.